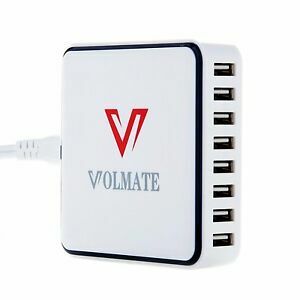 100-240 volt input ideal for international travel. Each USB port has a soft blue LED lets you know it's plugged in. Built with industry grade materials and premium circuitry, this product is CE, FCC and RoHS certified to ensure complete safety and reliability. Item just as described and is in perfect condition. Fast shipping. Thanks. Great seller fast shipping Honest communication. Exactly as described. Fast shipping. Thank you! Just what I wanted. Fast shipping. Thank you. This product charges multiple devices quickly. It has indicator lights on each port that tells you when a device is charging on it. It is well built. It sits well on a desktop. Doesn't take much room. Very lightweight. The cord is long enough to plug into a wall outlet and still sit on a desk or table. I just leave my devices plugged in. It only charges a device when it is needed. It is small enough to use as a travel charger. Based on quality, price, design, functionality and price I will be buying more of these. Great. It cuts off when each unit plugged into it is fully charge so you do not overcharge item. Thinking about ordering a second one.